When a person reaches out to place an object in just the right place, their mind makes a series of judgments requiring vision, stability and careful movement. Trying to do the same thing robotically from a hovering unmanned aerial vehicle (UAV) requires several technology advances. A DARPA-funded technology demonstration recently finished a successful testing of vision-driven robotic-arm payload emplacement using MLB Company’s (Santa Clara, California) tail-sitter UAV, V-Bat. This UAV is capable of both hover and wing-borne flight, making the delivery and precision emplacement of a payload possible. A special robotic arm was designed with the capability of carrying up to 1 pound. The research team designed and developed a low-cost vision system to estimate the target’s position relative to the hovering vehicle in real time. This vision system enables the UAV to search and find the target for the emplacement autonomously and then perform the action. DARPA’s precision emplacement technology demonstration paves the way for precise long-range delivery of small payloads into difficult-to-reach environments. --A newly developed stereo vision system that tracks the emplacement target and motion of the robotic arm. The vision system, coupled with global positioning system, controls the arm and V-Bat during emplacement. -- Control logic to maneuver the vehicle and direct the robotic arm to accurately engage the emplacement target. 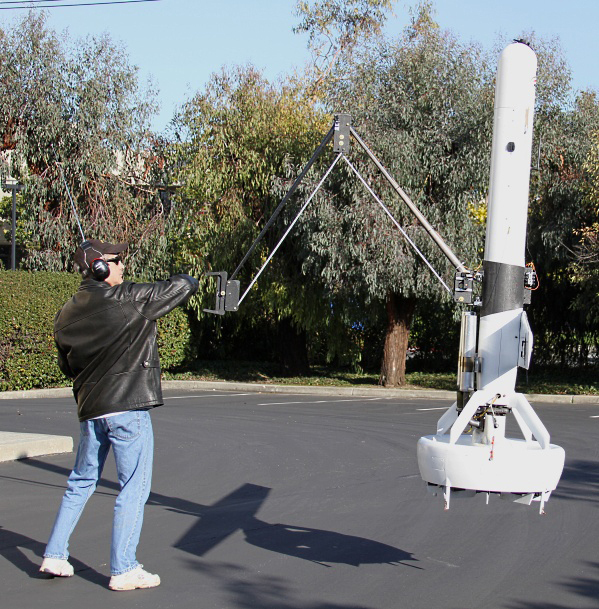 -- Vehicle stability with the arm extended 6 feet with a 1-pound payload. -- Autonomous search and detection of the emplacement target and autonomously emplaced a 1-pound payload.